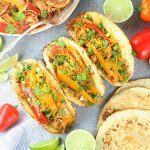 These Crock Pot Chicken Fajitas have so much zesty flavor! 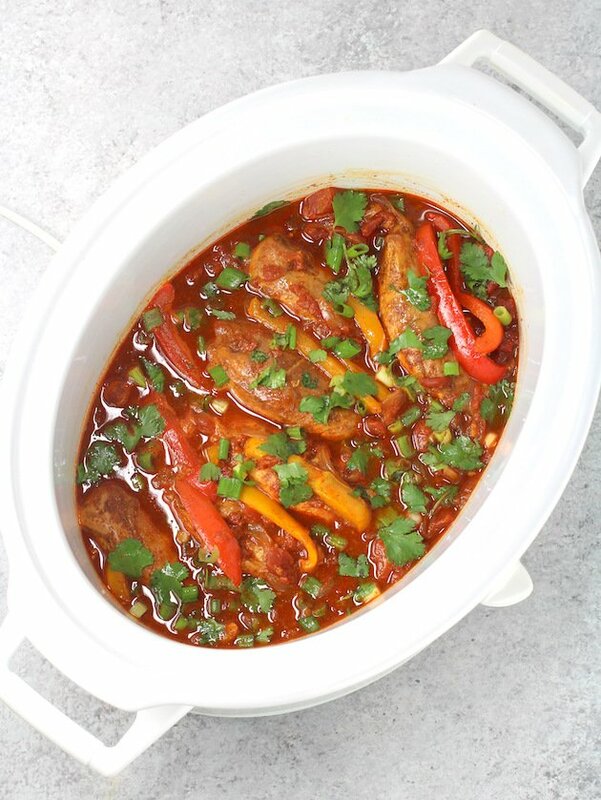 This easy slow cooker method is gluten-free, low-carb and basically cooks itself… just shred the chicken and devour! Serve up this yumminess as tacos, tostadas, burrito bowls or taco salad! But until the snow melts and the temps warm up, we’ll still be roasting and slow cooking all snug in our comfies, binging on Netflix. There’s a season for everything – right!? Even though it’s technically spring, I’m the one over here making all kinds of deliciousness in my Instant Pot and slow cooker. 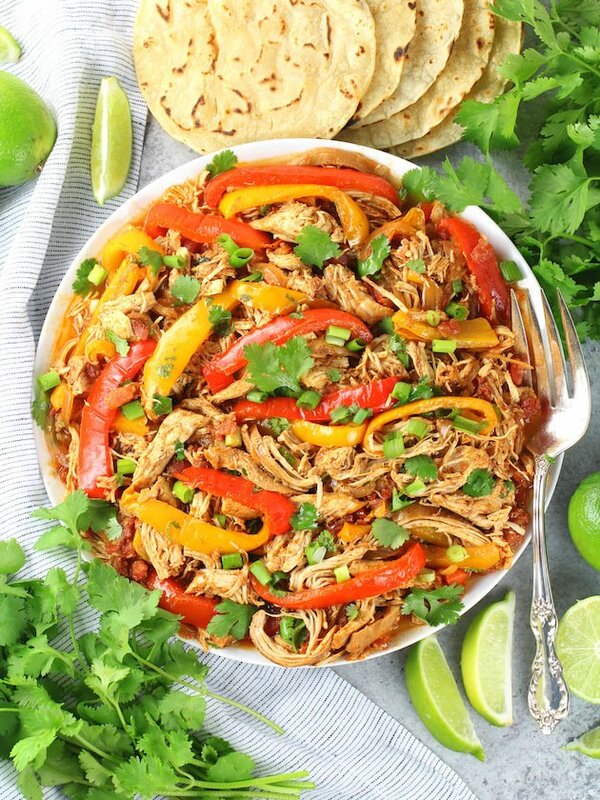 Like this fan-favorite Mexican Shredded Chicken – it’s soo good! And you can make it in the pressure cooker or crock pot for Taco Tuesday or a delicious fiesta with friends! We’re definitely all about our Mexican food in my house – I think the B man could eat it every day for the rest of his life. And I could probably eat cheesy homemade “refried beans” everyday for forever. Mmmmm! I love to slather them on a crunchy tostada all by themselves and devour. 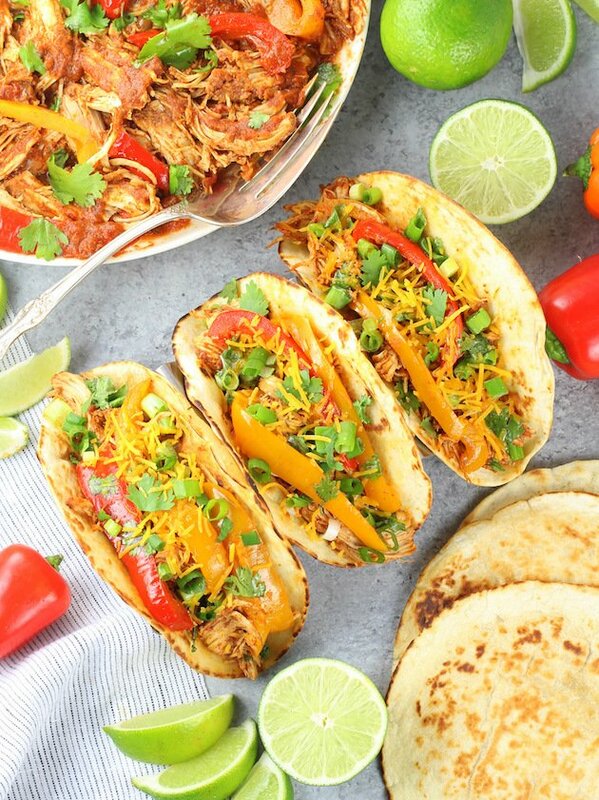 Since we’re a Mexican food adoring family, today I’m whipping up some Crockpot Chicken Fajitas! It’s tender shredded chicken drippin’ in the most delicious and flavorful sauce. With onions and peppers and all the fixin’s you want… it’s oh so muy fantastico my friend! This meal literally cooks itself: 3½ hours on high or 6½ hours on low and boom – dinner! It’s gluten-free, soy and dairy-free. Not. Even. Kidding. It’s completely low carb if you eat it over salad or with low carb tortillas. I know you’re “shooketh” right now – I’ll give you a moment. We should probably start talking about how all this zesty goodness comes together. 1- Add diced tomatoes and chilies into the slow cooker. Add the sliced onions and minced garlic. Place the chicken breasts on top and season them with taco seasoning. 2 – Cover and cook on high for 2½ hours, or 4½ hours on low. 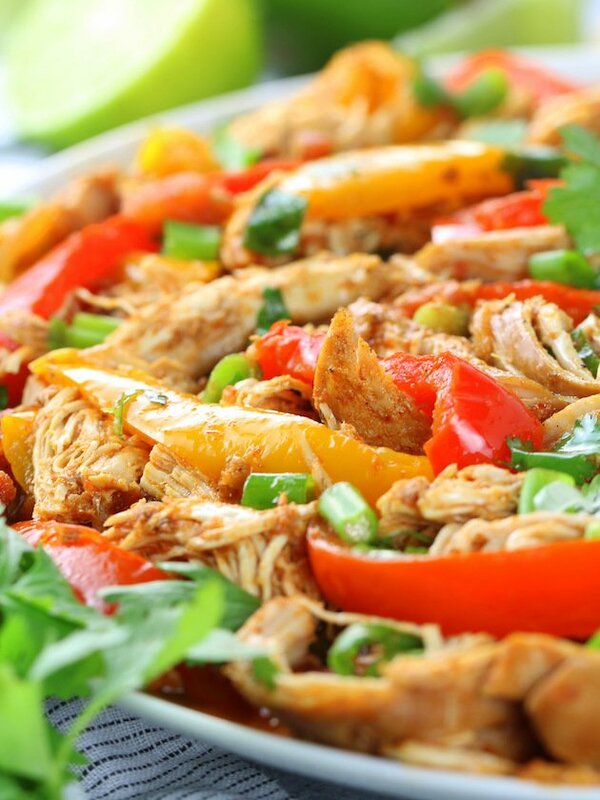 3 – Add the sliced bell peppers on top of the chicken, cover and cook for 1 more hour on high and two more on low. 4 – Remove the chicken from slow cooker and shred with a fork. 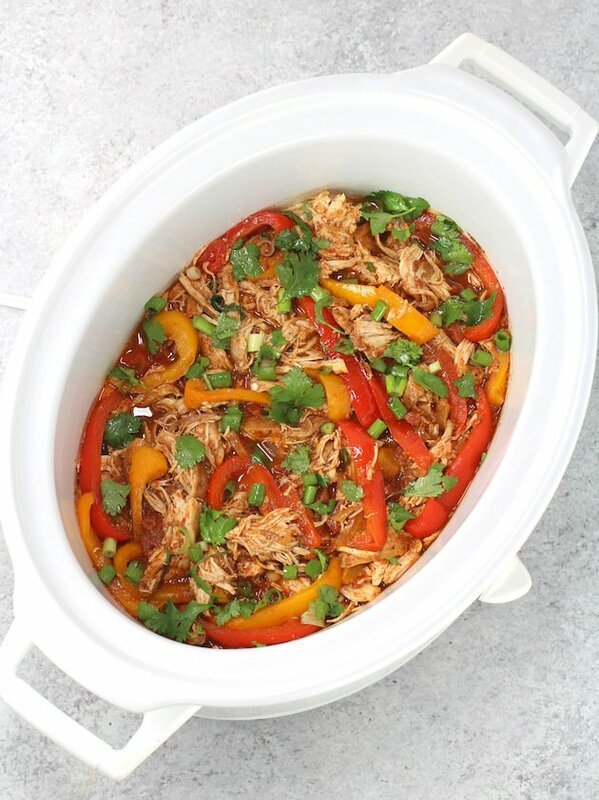 5 – Transfer the shredded chicken back into the slow cooker. 6 – Add freshly squeezed lime juice and some rough-chopped cilantro, mix together and taste. 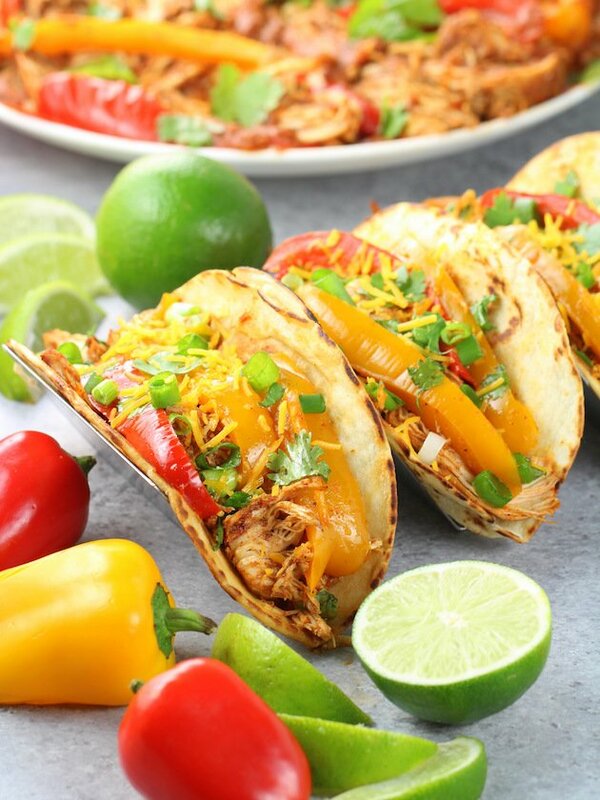 7 – Make tacos, serve over rice and beans, turn into burritos, nachos, or quesadillas or make a yummy Southwestern Chicken Salad. So easy and soooo good! This could be a great meal prep recipe for the week. Make up a batch on Sunday and you’re living la vida loca all week long! 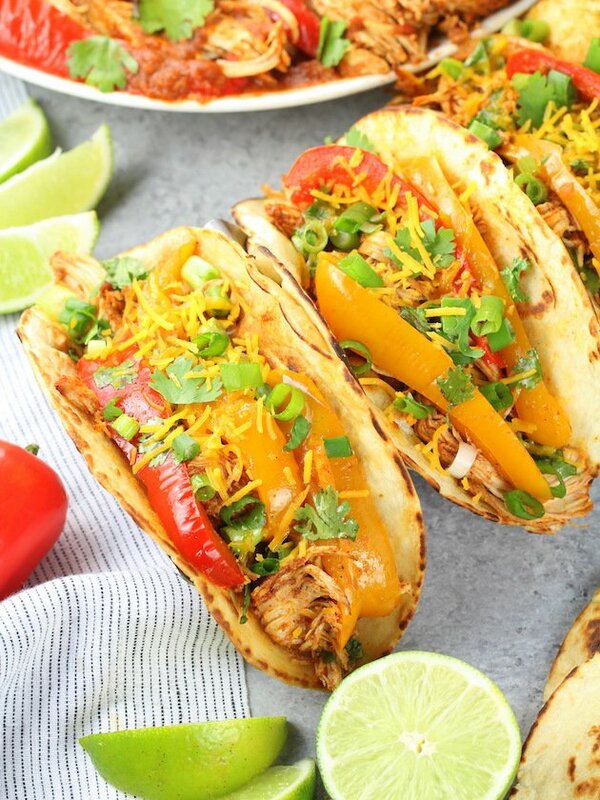 These Crock Pot Chicken Fajitas have so much zesty flavor! This easy slow cooker method is gluten-free, low-carb and basically cooks itself. 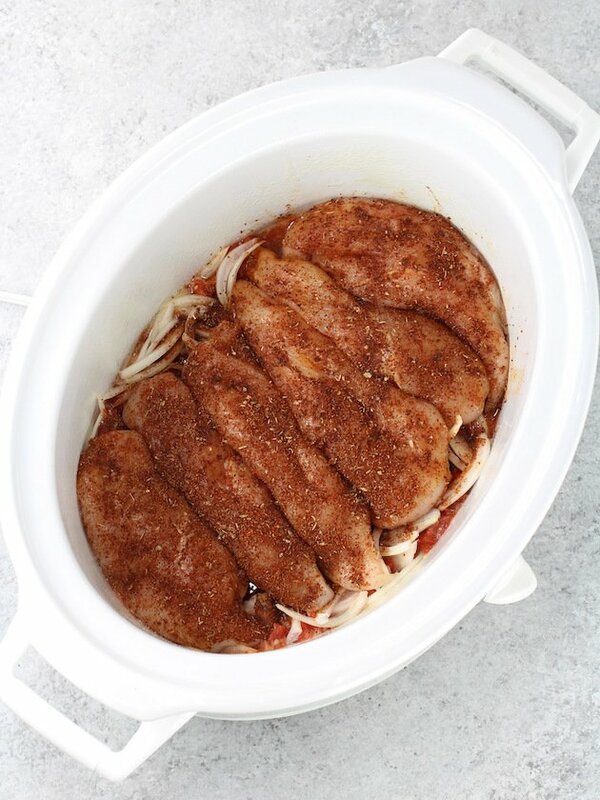 Add diced tomatoes to the slow cooker, then add the chicken breasts. Season them with taco seasoning, then add sliced onions and minced garlic. Cover and cook on High Temp for 2½ hours, or if cooking on Low Temp, then cook for 4½ hours. Add the sliced bell peppers on top of the chicken, cover and cook for 1 more hour if cooking on High Temp, or 2 more hours if cooking on Low Temp. Remove chicken and shred with a fork, then transfer back to the slow cooker. Add freshly squeezed lime juice and ¼ cup rough-chopped cilantro, and mix thoroughly. Make tacos, serve over rice and beans, or use in burritos or quesadillas. Garnish with toppings and enjoy. Serving size is 4 ounces or 1/2 cup.